I have known Carolyn for almost 7 years. I have been practicing law here in eastern Maine for over 30 years and much of my practice presently involves elder law issues. I am a member of both NAELA (National Association of Elder Law Attorneys) and the National Network of Estate Planning Attorneys. 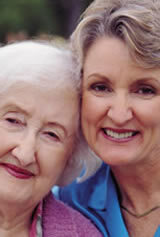 I have used Carolyn’s geriatric care services on at least 3 occasions involving my clients, and she has been wonderful. In one case involving a nursing home and a reluctant doctor, Carolyn helped me to get meds squared away for an elderly client who was being overmedicated. Carolyn was also a great help in this client’s final days at the nursing home, working very well with extended family as well as the professionals and lawyers involved. I have recommended Carolyn to others and everyone has told me they have been please with her work. Every one finds Carolyn to be professional. Ray Bradford Jr., ESQ, P.A. Carolyn Brennan-Alley, BSW, LMSW has been working in case management with our office for at least the last 3-4 years on a fairly regular basis. I have found her to be very professional and very compassionate in her work. It has been a pleasure to collaborate with her particularly on the care of elderly patients who are living in our area with no local families on which to rely for help. Carolyn has worked very hard to provide a liaison between our office and the patient's family. She has provided excellent assistance at home for these patients as appropriate to their level of need. She has often accompanied them to our office to advocate for them in obtaining the best medical care possible for many of the elderly adult patients under her care. I have found that the patients have been uniformly positive in their feedback to me in working with Carloyn. I believe she is a real asset to our local community." I am writing this note to thank you for all the wonderful work that you do with our mutual client. Your professionalism, expertise and attention to detail are exemplary. More importantly, is your willingness to go the extra mile. You always advocate for her best interests and provide the much needed liaison between physicians, family and care providers. Additionally, you provide transportation assistance, coordinate care, assist with medication dispensing and encourage and assist with community involvement. Your communication skills and frequent updates with our client’s status and review of plan of care are extremely helpful. This provides valuable information, needed for her physical therapy treatments and program development. On many occasions, our mutual client has stated how much she appreciates what you do for her and what a significant difference your assistance has made with her quality of life and confidence to stay home independently. Above all is your outgoing personality and easy approachability. Your helpfulness and professionalism is multiplied by your positive “can do” attitude. Your visits are always easy-going, fun and informative. It is a true pleasure working with you and I look forward to working with you in the future. Thank you for all that you do. My experience with Brennan-Alley & Associates has been excellent. Carolyn came to us in 1995 when my wife needed help while I was in the hospital. There was always help whenever we needed any details covered. Carolyn is always with me on doctor’s appointments. My doctors love having her with me. When I lost my wife Jane in March 2003, they assisted with funeral arrangements. Staffing that has been organized by Carolyn are with me daily taking care of the house and my many needs. Carolyn’s care management services make it easy for me to live independently. Most important, Brennan-Alley and Associates keep a check on my health requirements. Two years ago my son Craig met Carolyn at a meeting of professionals and asked her if she could help me. I was very depressed and she came to see me. She agreed to help and supervise all my care. She is a find! My life is so much better. She sets up my schedules so I can follow them. she arranges for care givers to help with meals, cleaning, shopping, laundry and any other needs. she found a replacement for a doctor and social worker who were leaving the area. She will do anything to help me! And, I feel better after finally finding the correct medication after 6 months! All of us, Red, Bunny, Michael and I want you to know how much we appreciate all that you did to enable my father to stay at home—and then to see that he got special care at the nursing home. I never worried when I knew you were there. And I particularly appreciate your support when there was a “crisis.” You always helped find a good solution. Thanks for being there. Caring for an elderly parent at home provides a number of challenges everyday. The best advice I was given was to consult with Carolyn. She identified our specific needs and made solid recommendations with regard to home care for my dad. With her expertise about community resources, her caring attitude and ongoing support, I was able to meet the daily challenges and enjoy this experience with my dad. Thank you, Carolyn!